Namibia holds a special place in my heart, not only because my late father was born there, but also because there is no other place like it on this planet. It’s a truly amazing place. I vaguely remember visiting Namibia as a child but I was just too young to comprehend where I actually was and to be honest, I still struggle to wrap my mind around the beauty that resides there. I returned to Namibia recently, along with my family, to pay tribute to my dad’s life, to bring him home and to say goodbye. This was a remarkably special trip for me and I have chosen several photographs of my journey that showcases some of the beauty of Namibia, but they also have particular relevance and represent something more to me that simply can’t be expressed. I hope you enjoy them. 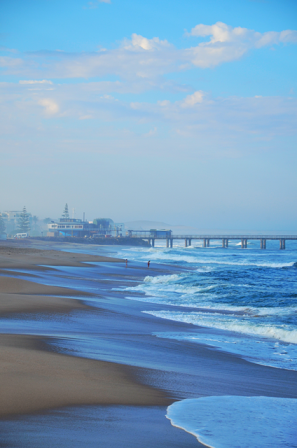 Swakopmund is situated 360 km west of Windhoek and is a popular coastal holiday destination for local Namibians. This German colonial town is also a tourist hot-spot and khaki-clad Germans are as common as the sand on which the town is built and they can be found marching in the streets and drinking beer in every restaurant and pub in town. Swakopmund is the gateway to the vast Namib Desert and it also happens to be where my Dad grew up, which makes it significant, to me at least. Compared to similar towns in South Africa, Swakopmund is remarkably clean and the people here are really friendly. The architecture of the buildings in Swakopmund point to its German heritage and many of its residents are actually German. 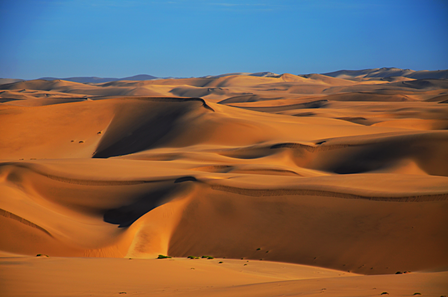 The Namib Desert is the oldest desert on earth with an estimated age of 55-80 million years and is largely uninhabited. Just beyond the town of Swakopmund, sand dunes unfold into the distance and the landscape here is nothing short of spectacular. We had some time on our hands and decided to take a two-hour quad bike tour of this sandy abyss. Our guide, Gideon, was a friendly Namibian chap who knew his way around the dunes and ensured that we didn’t get lost in the bowels of this vast landscape. 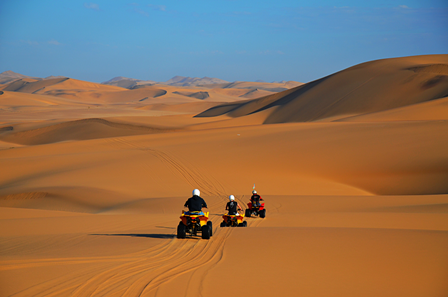 Exploring the Namib Desert on the back of a quad bike is a great way to have some fun and experience the desert up close and personal. This was definitely one of the highlights of our trip. Our main reason for coming to Namibia was to search for Welwitschia Mirabilis, an extraordinary plant that is perfectly adapted to life in the desert. 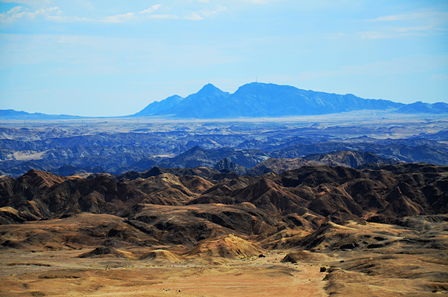 A few kilometers out of Swakopmund, we entered the Namib-Naukluft Park which is home to the famous Welwitschia plains. Along the way, we stumbled onto what is known as the ‘Moon Landscape’, a barren and eerie looking Damara Granite landscape that formed some 460-million years ago. As barren and devoid of life as it is, the ‘Moon Landscape’ is strangely appealing to the eye and serves as a reminder of how harsh and unforgiving this place can be. We pushed on towards the Welwitschia plains some 80km from Swakopmund and eventually crossed the dry Swakop River bed. With our petrol running low, we decided to pull over and take a closer look at the strange but intriguing Welwitschia Mirabilis. The plant is endemic to Namibia and southern Angola and is only found in what is known as the ‘fog belt’ stretching roughly 1000km along the west coast from the Kuiseb River south of Walvis Bay to the Nicolau River in Angola. Most Welwitschia Mirabilis specimens are found within 80-100km of the coast and consist of a large tap root and a short hardy stem which produces only two strap-like leaves that grow continuously to lengths that can exceed three meters or more. Apart from groundwater, the plant survives largely on fog condensation which is captured by the leaves and channeled into the ground which is then absorbed by the tap root. The Welwitschia Mirabilis is commonly referred to as a ‘living fossil’ because this ancient plant can live for hundreds if not thousands of years. 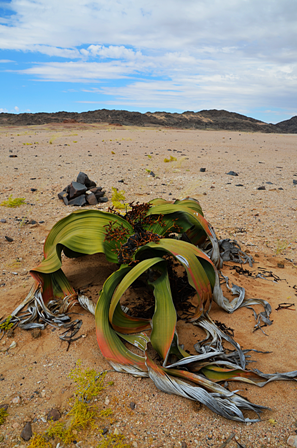 The Welwitschia Mirabilis is undoubtedly the ultimate survivor of the desert and is plentiful in this region, but treat them with respect, they are considered to be endangered and are reasonably well protected in Namibia. With our mission accomplished and only one day left in Namibia we headed to Erindi Private Game Reserve some 175 km’s from Windhoek. 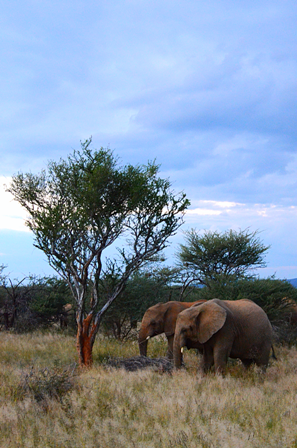 Erindi is massive and is home to just about all the animals you would expect to see in Southern Africa. The accommodation was stunning, with a big waterhole on our doorstep and crocodiles basking on its banks, it couldn’t get any better than this. Lucky for us, we arrived just in time for the evening game drive, the perfect opportunity experience the bush and photograph some animals. Ully, our Herero guide, guaranteed some good sightings and he certainly lived up to his promise. 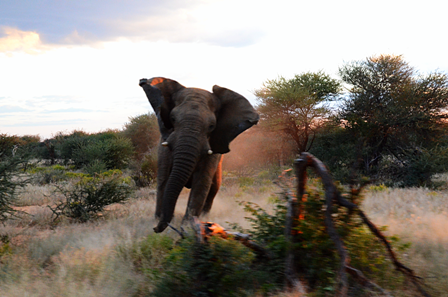 It was only five minutes into the game drive when Ully’s radio came to life. There were lions nearby. We made our way to the sighting and sat for a couple of minutes watching the lions lounging in the grass. 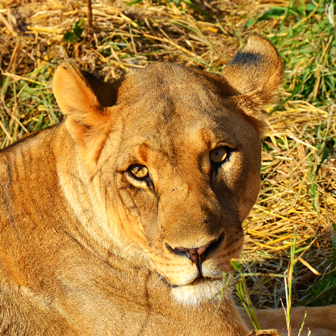 A particular lioness, shown above, unsettled me. Her wild stare pierced right through me and I couldn’t help but think that she wanted to eat me. As more vehicles arrived on the scene, we decided to head off in search of tamer game. About 30 minutes later, the radio informed us of African Wild Dog in the area and Ully put his foot down in hot pursuit. 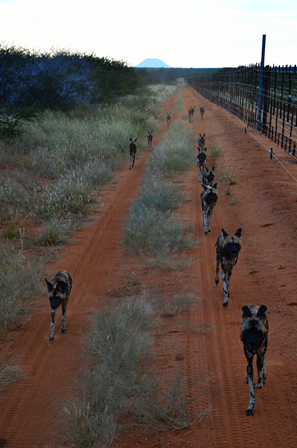 We found the pack along a boundary fence and I was happy to lay eyes on them, for I had never seen them in the wild before. The game drive was turning out to be a treat it seemed. It was great to see them purely because the African Wild Dog is the most endangered carnivore on the continent and are rarely seen in the wild. I never imagined them to be so slender, almost to the point of looking under-fed, but Ully explained that they will run their prey ‘dead’ and are fierce and highly intelligent hunters. 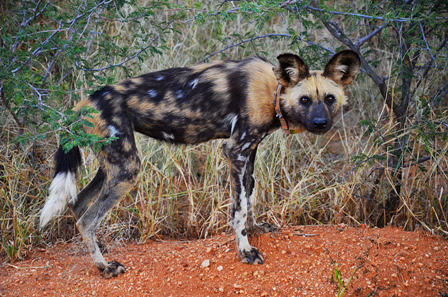 Erindi only has one family of African Wild Dog with 14 individuals. The picture above shows the alpha female of the pack posing beautifully for the camera. Shortly after this photo was taken, the radio alerted us to elephant in our vicinity and we left the African Wild Dogs to their business. A while later, Ully stopped the vehicle and showed us fresh elephant tracks on the road accompanied by liquid spatter in the sand. “An elephant in musth” said Ully, apparently not something you want to encounter face-to-face. We drove on for a while and spotted two White Rhino grazing peacefully in the bush. Ully switched the vehicle off and we watched them intently. Then, the unexpected happened. 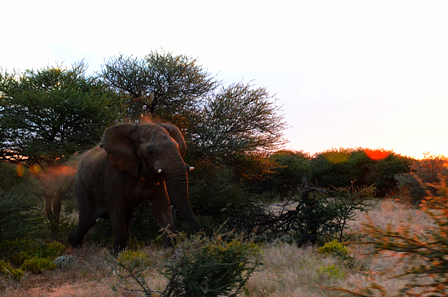 About 100m ahead of us, a herd of elephants crossed the road and out of the bush, Stompie appeared. Stompie is a large bull elephant and the dark temporin secretion on the side of his head confirmed that he was in musth. Elephants become highly aggressive when in musth and Ully told us that Stompie was notorious for causing trouble in the reserve. Unbeknownst to us, Stompie was about to show us his dark side. Upon spotting the rhino’s, Stompie charged at them and drove them away into the bush. Ully started the vehicle and moved slowly forward to get a better view. Then, Stompie turned his attention on us and chaos ensued. I’ve never been charged by an elephant, but let it be known, there are few things scarier than a bull elephant in musth bearing down on you. This was a pure, adrenalin infused moment. Ully put his foot on the gas and my family were in a flat panic screaming ‘GO!! GO!! GO! !’ while Stompie charged us at full speed. In the chaos, I managed to maintain some composure to capture this amazing image of Stompie doing what he does best, being the boss of the bush. This was by far the most intense experience I’ve ever had in the bush so far and I will remember it for the rest of my life. We kept a safe distance from Stompie and set off to find the breeding herd nearby. Ully told us that the reason why these elephants have such short tusks, unlike the elephants from the Kruger National Park in South Africa, is because they lack the necessary calcium in their diet, an interesting fact I wasn’t fully aware of. We watched the elephants for a while, keeping a keen eye-out for Stompie feeding nearby, before moving on for sundowners in the bush. 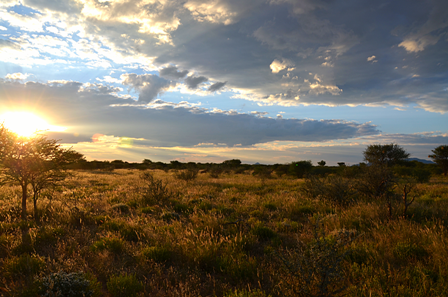 With gin and tonic in hand, we watched the sun set over Erindi, the perfect way to end a perfect trip. Somehow I knew I would return again, someday. This entry was posted in Travel and tagged Adventure, African Wild Dog, Animals, Elephants, Erindi, Erindi Private Game Reserve, Game Viewing Erindi, Lions, Moon Landscape, Moon Landscape Namibia, Musth, Namib Desert, Namib-Naukluft Park, Namibia, Namibia Pictures, Photography, Rhino, Sunset, Swakop River, Swakopmund Namibia, travel, Welwitschia, Welwitschia Mirabilis, Welwitschia plains, Welwitschia Trail. Bookmark the permalink. I enjoyed studying too, but thank you.